Preheat oven to 350 degrees F. Line the bottom of a jelly roll pan with parchment paper. Don't grease the pan. Following directions on cake mix pkg, prepare angel food cake. Pour into prepared jelly roll pan and bake for about 20 minutes. While the cake is baking, prepare a clean tea towel by laying it flat on the counter and sprinkle with the 1/4 cup of icing sugar. Just before serving, beat the cream cheese in a large bowl until smooth. Add the 3/4 cup of icing sugar, vanilla and the whipping cream. Mix on low until combined and then on high for 3 to 4 minutes until fluffy and stiff peaks form. 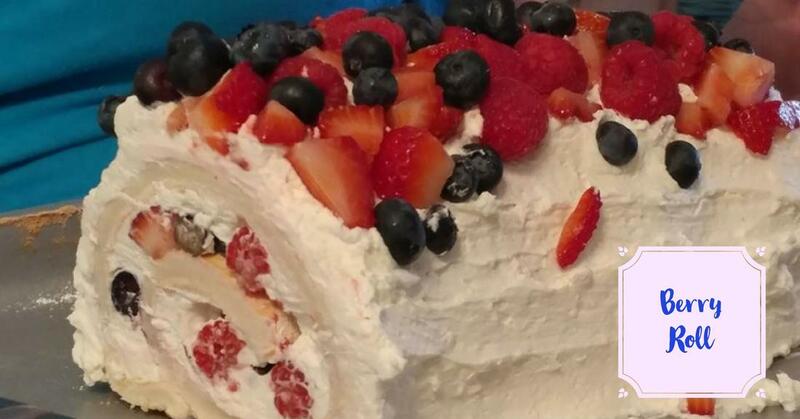 ​Unroll the cooled angel food cake and spread with half the cream filling and spread about half the berries over the filling. Carefully roll the cake back up, (without the towel!!) and place on a serving platter. Spread the rest of the cream filling over the top and sides and top it all off with the rest of the berries. Serve immediately. Any leftovers should be eaten within 24 hours. I got this off of facebook and I couldn't find the actual recipe again to give credit where it is due. Sorry about that. If I find it, I will add it later.